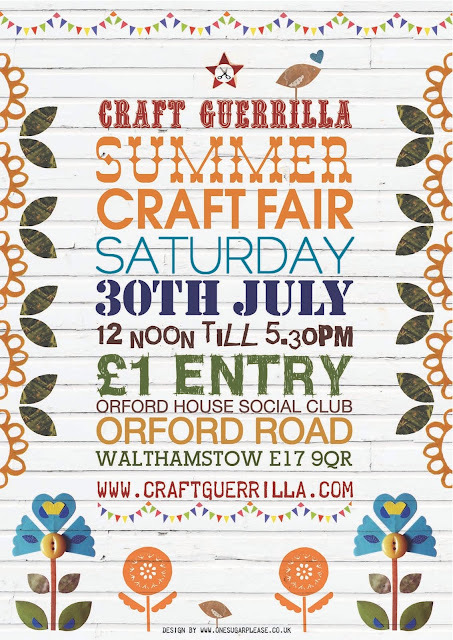 This Summer on Saturday the 30th July we are proud to announce our participation in the amazing Craft Guerrilla Summer Craft Fair. Held in the gorgeous Orford House Social Club in the mighty ballroom the Guerrilla team have hand selected the best,most talented designer makers (which includes us!) in order to curate a shopping event that will have you swooning for all things hand made! So if you fancy coming to one of East London's finest fairs get on down to Walthamstow Village. Make Easy table- join in the hand made movement and tons of beautiful and chic shopping! A hop and a skip from the station! Limited Edition Handprinted Cosmetic Bags - SALE!